Sounds like a fairy tale of some kind involving veggies like cabbage, lettuce and other greenery. But it’s not. 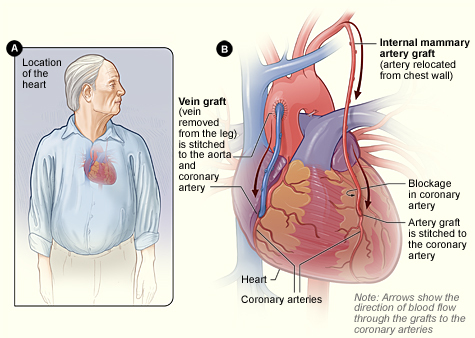 CABG is the abbreviation for Coronary artery bypass grafting, something I had no idea about 2 weeks ago. DH had 3 of those grafts, the mammary artery and 2 from his leg vein. Over time, plaque can harden or rupture (break open). Hardened plaque narrows the coronary arteries and reduces the flow of oxygen-rich blood to the heart. This can cause chest pain or discomfort called angina< (an-JI-nuh or AN-juh-nuh). I have to say it’s amazing how quickly the body can begin to heal after such an assault. So far, we’ve seen the surgeon’s nurse practitioner and the visiting nurse. Both say he’s doing very well for such a short amount of time. There’s still some pain, some coughing, and other inconveniences but it’s amazing what modern medicine can do! This entry was posted in Heart Attack and tagged angina, arteries, artery, blood clot, CABG, Coronary artery bypass grafting, cough, heart attack, NIH, nurse, oxygen, pain, plaque. Bookmark the permalink. Glad to hear that things are going fairly smoothly! In terms of recipes, I think just about any recipe with sour cream can be made with plain no-fat Greek yogurt instead; quinoa is a great rice alternative; Smart Balance or Olivio spreads instead of butter; vinegar-based salad dressings; cheese will probably never have the cardiologist’s approval; and red meat = bad, chicken/turkey = better, and various fish and scallops = best. (I’d do fine on a heart healthy diet except for the seafood thing!) My aunt has apparently found some salmon and tilapia recipes that they can enjoy (they aren’t fans of fish for anything but health reasons), and even I like her swordfish. I can ask for her recipes if you want! Thanks so much J! 🙂 I forgot about quinoa, even though we have some right here. I found out that potatoes have no fat or sodium although they are high in carbs. We’ll have to see what the cardiologist thinks about those on Monday!